A £20 million funding injection is being given to cycle infrastructure for cities, towns and villages across England. Announced today by Transport Minister Norman Baker at an Active Travel conference in Leicester, the funding is to help people take to two wheel and may be used for a range of projects including better cycle facilities at railway stations, improved cycle links, or projects to improve the layout of road junctions to make them more cycle-friendly. The DfT said that previous investment has seen ‘great projects making a real difference in communities’ such as better cycle routes from residential areas to schools to encourage the next generation of cyclists to cycle more regularly. Public Health Minister Anna Soubry also attended the conference with Baker, discussing how councils’ health and transport officials can work better together to deliver better options for cycling and walking in their local areas. 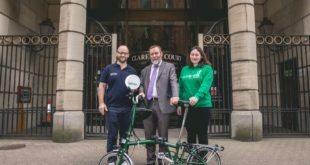 Baker said: "Cycling is great for your health, the economy, and for the environment so we are determined to make it easier for people to cycle whether for leisure, getting to the shops or as part of their commute to work. "Following the success of the Olympics, there is a huge appetite for more cycling provision from the travelling public and we need to capitalise on this enthusiasm at local and national level. "That is why we are investing £20 million in cycling infrastructure and getting councils to bring an end to silo working in their offices." Public Health Minister Anna Soubry added: "Being active helps us stay healthy and protects against life threatening conditions such as heart disease, type 2 diabetes and certain types of cancer. "Cycling is a great way for adults to get their recommended 150 minutes of physical activity each week and this funding will help encourage more people to get involved. "The £20 million announced today is in addition to £30 million already announced for similar projects this year which drew in an additional £15 million in matched funding from local sources. The projects to be funded will be announced later in the year." Cycle advocate Sustrans, British Cycling and the CTC have all praised the move. Sustrans chief executive Malcolm Shepherd said: “There is massive untapped potential for local cycling journeys but many people are put off cycling by the safety fears on our road, so now is the time to put cycling at the heart of towns and cities across the country." Twitter and Facebook reactions to the story have been similarly welcoming of the investment, but critical over the fact the £20m represents a small slice of the transport budget. There’s more on the reactions here.